Every wedding season we love to attend as many wedding fairs as possible! This is where we get an invaluable opportunity to inform every bride we meet about our wonderful services – AND that they do not have to spend extortionate amounts to achieve their dream bridal look! Here are our upcoming shows, if you would like to attend any, we look forward to meeting you there! They are a fantastic means to see a venue with its wedding decor and meet all the recommended suppliers. 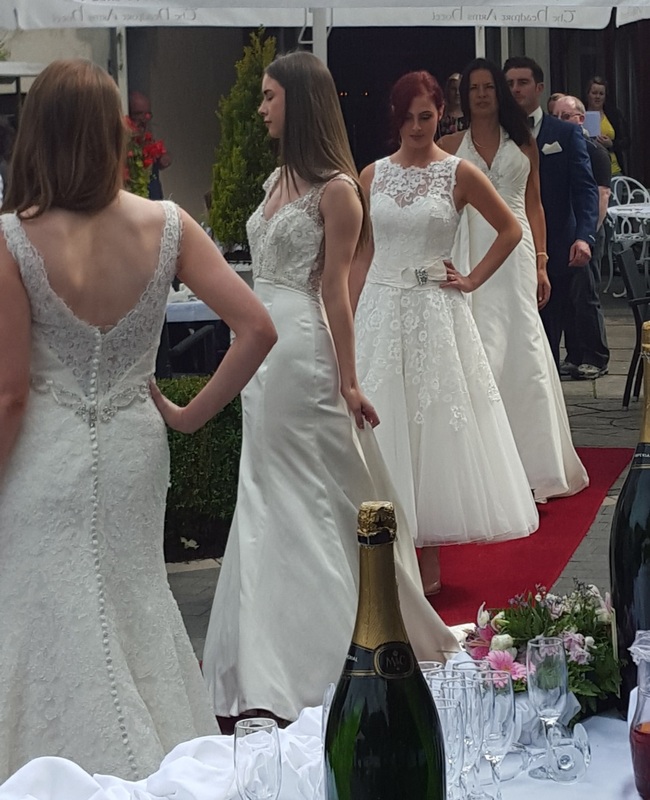 The Headfort Arms show is amazing – it includes a fashion show with Assets models showcasing our latest discounted wedding dresses. The Castle Arch Hotel Open Evening Friday 16th Feb 5-8pm AND Saturday 17th Wedding Fair – by Appointment Only – contact hotel if interested in meeting the wedding co-ordinators. We look foward to meeting you there. Don’t worry if you can’t make it to the shows, you can still book your private appointment to view our dresses. We really enjoyed Stationhousehotel Kilmessan wedding fair last Sunday! If you missed us, This Sunday Oct 1st, you can view our dresses, chat with me (Adele) from 3-6pm in one of Trim’s finest hotels Trim Castle Hotel! 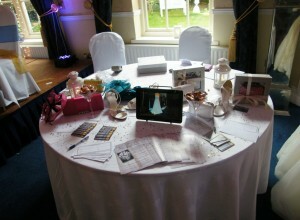 We always look forward to this wedding fair, as we meet so many enthusiastic couples excitedly planning their big day. Also the wedding room is all set up for you to see & the decor & views are breathtaking! Sofia, our stunning model, will be wearing a Swarovski crystal adorned gown by Kenneth Winston, (pictured),retailing at €3,000 but with us for only €1,499! Win! 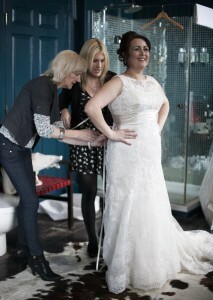 A Fabulous Bridal Pamper Day!! We have teamed up with some fantastic wedding suppliers and created the perfect bridal pamper day package, just for you! If you are stressed out at even the thoughts of creating your dream wedding, bewildered at where to start looking for the professionals that will ease apprehension and ensure your dream bridal look is easily achieved, we are here to help! In association with The Westgrove Hotel , Clane’s finest four star wedding venue, The Diamond Touch Bridal Beauty , professional hair and make-up duo Trish and Stacey (you simply must check out their excellent talent! ) and Pat Tinsley Photography , we are currently running a competition on Facebook to win an enviable prize! What is this fantabulous prize?!! Read on!! 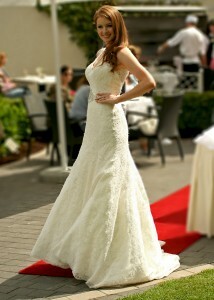 ** Select your Dream Wedding Gown to wear on the day at our boutique. ** Receive a Voucher for €100 off ANY dress in the boutique. ** The Diamond Touch Bridal Beauty will professionally perfect your bridal look with the ultimate Hair and Make-up Bridal makeover. Visit and like their page! View their bridal makeovers! ** Relax and unwind while being pampered in one of the Westgrove’s beautiful hotel room. ** Walk the Catwalk if you dare! Show off your beautiful new bridal look! ** Ensure your bridal look is professionally captured by Pat Tinsley Photography. Pat will provide you with a copy of your bridal makeover pictures! Like and Share on Facebook for a chance to win this Fantastic Dream Pamper Day! Winner will be selected and notified on the 3rd of October 2015. A visit to Timeless Bridalwear in advance of the wedding fair is necessary to select a dress to complete the bridal look. Terms & Conditions Apply! Good Luck Ladies! http://www.timelessbridalwear.ie/wp-content/uploads/2015/09/Page1.jpg 600 800 lizzelle http://www.timelessbridalwear.ie/wp-content/uploads/2013/04/logo1.png lizzelle2015-09-15 13:02:402015-09-15 13:22:30Win! A Fabulous Bridal Pamper Day!! Wedding Fairs – The Hidden Preparations! Wedding fairs are the core ingredient for engaged couples preparing for their special day, where a venue hosts top class suppliers, showcasing everything from wedding favours to chocolate fountains! The fairs are an excellent starting point for couples who aren’t sure where to begin planning a wedding as all exhibitors and wedding coordinators are on-hand for a chat or to answer any questions couples might have. They are a buzzing haven of information on the necessities for modern weddings, the one-stop-shop for meeting staff and suppliers, discovering a wealth of advice from photography prices to tailored package deals to the delicious taste of red velvet cake. However, it is forgivable when overcome with anticipation and enthusiasm upon entering the venue, to overlook the effort and time that goes into organising a wedding fair, from the venue’s marketing campaigns and ballroom preparations to the individual supplier travelling and setting up their stall to exhibit and showcase their unique service. Many venues spend lots of time and energy on advertising and preparing for an upcoming wedding fair, which they usually host twice in the year. It is an important opportunity to show off the ballroom and service to couples at its absolute best from general decor,fresh flowers and mood lighting to the staff and bridal suites. Simultaneously, the exhibitors are also seeking to show off their unique services on the day and Timeless Bridalwear are no exception! In preparation for a wedding fair, the groundwork for us typically starts a week to ten days prior to the show. We market our attendance to the fairs widely on social media and ensure to follow up on any queries. Over the past two years we have mastered the ideal layout of our stands, depending on the table size and location in the ballroom. A small bit of subtle visual merchandising is key to attracting couples to a stall! We also run competitions including vouchers and freebies, which we has proved very popular! Care and thought is put into the stand and table layout in order for it to attractively allow brides to see our great service! Our table holds all information on what we offer brides – leaflets, business cards, competition forms for exciting prizes and completed with soft candle lit lanterns and scattered stars for that extra sparkle. We never tire of meeting new brides and they are genuinely in awe of the value we provide and the savings they can make, there’s no need for a sales pitch! A fashion show is an extremely interesting addition at a wedding fair and we have been fortunate enough to partake in many over the last two years. Sometimes the venue will hire models for the fashion show and other times we supply our own experienced models. We hold one or two meetings in the boutique to ensure our dresses fit the models perfectly and if not, which dresses require a nip/tuck here and there! We aim to choose a variety of styles and sizes and to give each dress a chance to get its day in the limelight. Once the dresses are finalised (which can take hours!!) each one is devotedly described in order of appearance they partake in the show. The details are sent to the compère in advance of the show in order for them to familiarise with and liaise with us on any issues. On wedding fair day, set up begins around two hours before kick-off, with all suppliers busily setting up their attractive stands before resting with a cuppa prior to opening. With minutes to go to the fashion show, the models are secure in their first set of dresses, ready to show them off their to best potential. An air of excitement coupled with the adrenaline keeps everyone pumped! Once the first run is complete, the pressure is on the models to undress and hurry into the next gown, not forgetting a veil or headpiece, but this is all part of the fast paced nature of a fashion show! Precision and Care taken to lace-up a beautiful Sophia Tolli gown. Couples attending one of our shows can expect to see an array of beautiful gowns, typically ten to twelve dresses will feature. It’s certainly an invaluable opportunity to see dresses come to life; they are so much prettier than sitting on a hanger! The enormous effort from all suppliers to organise a wedding fair ensures that couples can gather all the important aspects of the big day under one roof. They can gain fresh ideas and make informed decisions about their big day. This makes it all worthwhile! 5pm comes too fast – time to pack up in anticipation of the next wedding fair – all in a day’s work! http://www.timelessbridalwear.ie/wp-content/uploads/2015/07/Timeless-Bridalwear-Headfort-Arms-Hotel-Wedding-Fair-July-2015.jpg 720 960 lizzelle http://www.timelessbridalwear.ie/wp-content/uploads/2013/04/logo1.png lizzelle2015-07-31 18:40:082015-08-01 13:59:30Wedding Fairs – The Hidden Preparations!